Christchurch, NZ and St. Louis, MO (December 18, 2018) – Motorsport Solutions is excited to continue its tradition of preparing tomorrow’s racing champions with a full lineup of impressive drivers in this year’s New Zealand Formula Ford National Championship Series and the team is pleased to confirm that young American racing standout Spike Kohlbecker will be relocating to New Zealand to join the team and continue his impressive debut in open-wheel formula car competition. Kohlbecker will be joining the team for round two of the National Championship at the famed Ruapuna Raceway in Christchurch, New Zealand. Spike Kolhbecker celebrates another podium finish with a post-race handshake. “Having the opportunity to further develop a young rising star like Spike Kohlbecker is indeed exciting for us, we have some experience with a number of other drivers from the states that have gone on to careers in racing,” commented John Crawford, team principal of Motorsport Solutions. “Spike has an impressive resume which includes 11 years of kart racing, and an obvious dedication and commitment to his motorsports career anchored by a remarkable run as a factory karting pilot for the US chassis manufacturer, Margay, and a breakout season in Formula 1600 in Canada. I am also thrilled that Spike is fully committed to not only racing with us but working in the shop to advance his understanding of the true mechanics of the car. Spike will surely benefit from the strong competitive tradition of Formula Ford racing in New Zealand,” added Crawford. 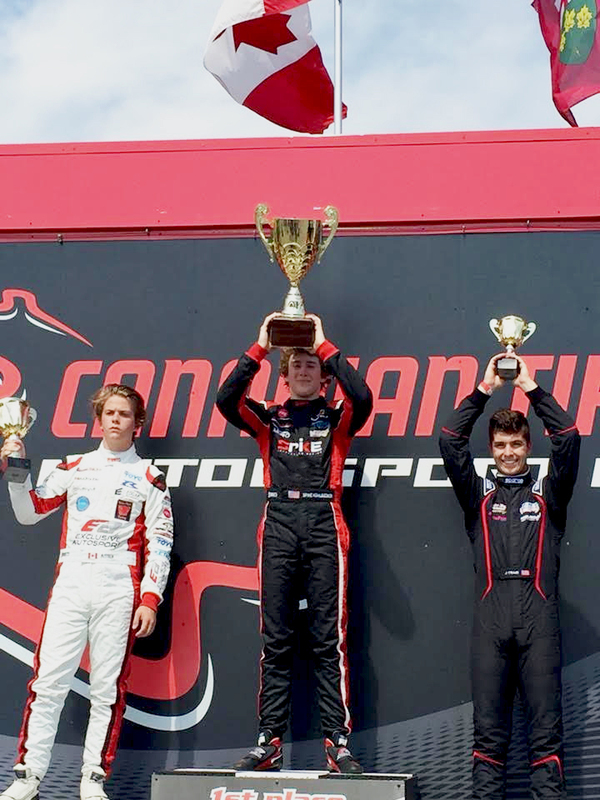 Spike climbs the top step of the podium to celebrate another win at the legendary Canadian Tire Motorsport Park (formerly Mosport). Lead by team principal, John Crawford who started in Formula Ford in the late 70’s, Motorsport Solutions is dedicated to their customer’s success. After a successful career as a driver and then as an engineer running four international race teams both in the UK and USA, John and his wife Trish started the racing school at the famed Ruapana International Raceway in Christchurch, New Zealand in 1990. John would later turn his attention to engineering and car building in what would lead to the development of Motorsport Solutions NZ Ltd.